After 20 years, I'm not actually sure what we specialize in! 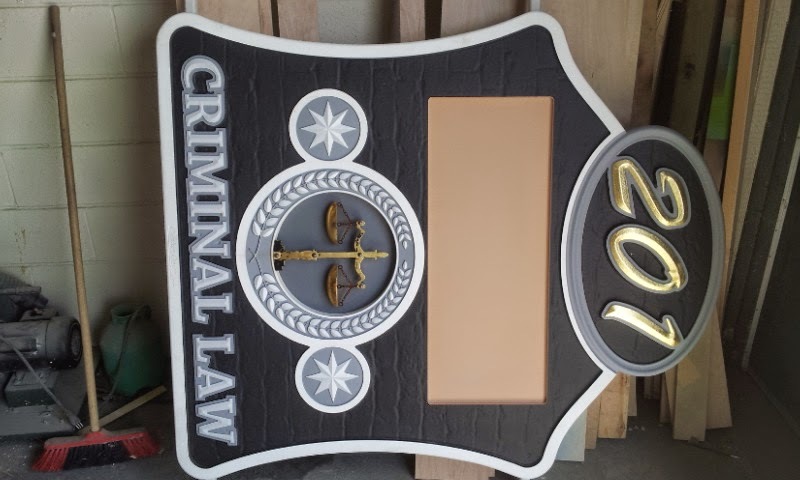 We certainly specialize in fabricating everything creative, but it can be pretty hard to elaborate on that statement. A while ago we made miniature construction workers, and last week we specialized in a gingerbread theme for a print advertising spot. This week, we're building a 2 part fabrication for a one night event. One part is 5 custom table tops, and the other part is a chandelier type project made with 80 small acrylic hockey sticks! Sum that up in a quick conversation! The acrylic chandelier we're building is a 3 tiered set-up. This will be lit from the inside, as well as have cascading LED's running down every-other hockey stick. Not shown in the render will be 3 logo's wrapped into a circle at the top. The whole assembly will hang from a truss system at the venue's ceiling. 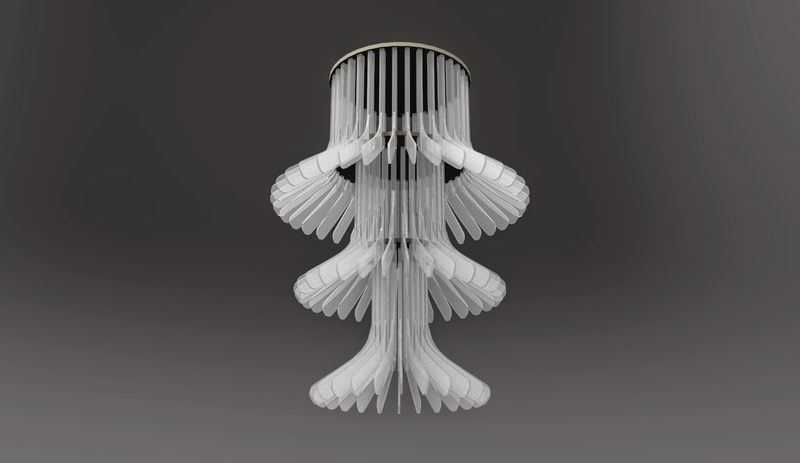 We've also had to shorten the overall height of the fixture, due to the headroom available. So the whole unit, logo's included will now only be 5.5 feet total. The first order today was to cut into the 3/4" thick, 4 X 8 sheet of cast acrylic. This will become the handle portion of the chopped hockey sticks. It was pretty amazing to try and get that sheet onto the table saw! I'm guessing the weight was somewhere around 250 lbs. What a load of crap lifting that was! I love cast acrylic! Easy to cut, high melting point, and just a plain joy to use. I got all the handle portions cut to size, then used a wobble dado to cut in where the blade will get glued on. I also milled a rabbet on the other-side of the handle for the cascading LED light strip. Only half the sticks get these LED's, so I only ran these through the saw. The wagon, lunchbox, and the easel got sprayed and finished up. I used two pieces of foil tape stuck back to back, and sprayed white, to make the paper on the easel. It doesn't look like they used it in the end, but the option was there anyways! It's a little funny on some projects, but there always is one part that constantly weighs on my mind during a build. It's that one part that haunts me until I figure out how the heck I'm going to make it. Sometimes it can be a complicated assembly, other times it can be as simple as the order of masking for paint. But for me, there's always one. On this build it was the shovels. Simple when it's done, but not so apparent when we start. It was the shape and scale thickness that was my curse! They were to thin to sculpt from Aves epoxy putty, which we used for all the sculpting portions on this. I decided finally to laser cut the shovel blade from thin magazine cover paper, then wrap it onto a wire. Once I shaped the blade it to it's final form, I treated it with super glue to hold its shape, and hold it to the wire handle. Done! Haunting over! 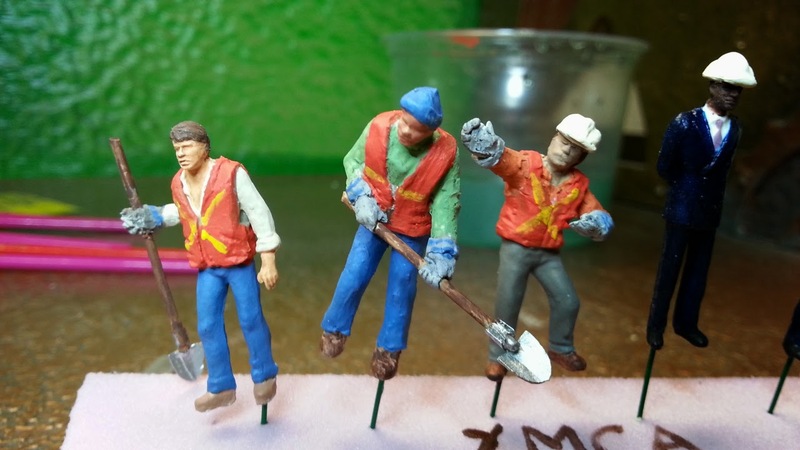 Jody did a great job painting the figures. You can't see it, but she painted lettuce and tomato on the right guys sandwich. Now that's dedication. I might keep her on after her 3 month probationary period. The final piece was the long saw blade. That was laser cut from .02" PETG. Not great material to laser cut, but it fit the bill! Jody did have to change a couple of characters on the day of the shoot, but it was a quick re-paint. The little ones work the hardest! Now that the NDA is over on this job, I think I'll work the build backwards! Starting with the final result! This job was through photographer Vicky Lam. A great commercial photographer, and an even more stellar person to work with! PLUS......she's only the second person I know shorter than Jody! 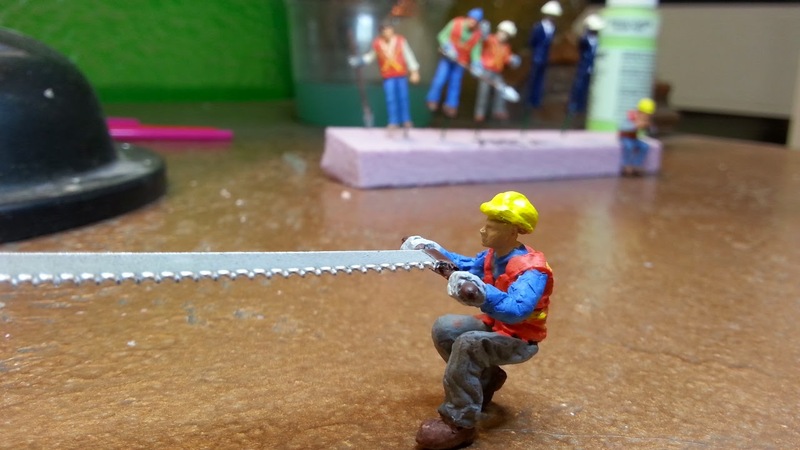 Vicky specializes in shooting miniatures, and when she contacted us for this job, we were totally on board! This was another short deadline job. The go-ahead was on a Friday at 3pm, and it was due on the following Monday at 9 am. Alas, this would have been the perfect job for our Hi-res DLP printer that we ordered, but ours won't arrive until the end of THIS month, so we had to rock it old school! I hired a wonderful sculptor that I used to work with years ago, name Garfield. He came in to tackle the little people and their little details. The clients were very specific about what poses and swag the little people had on! While Garfield set out to work on the little people, I started on the very tiny construction wagon they wanted. This will be full of seed in the final image. I drew these up quickly in Aspire, and cut them from .060" styrene, then glued the flats up. The other task for me was fabricating the miniature easel that holds the construction blueprints. This again was done from styrene, with evergreen stryrene strips for the legs and wagon handle. 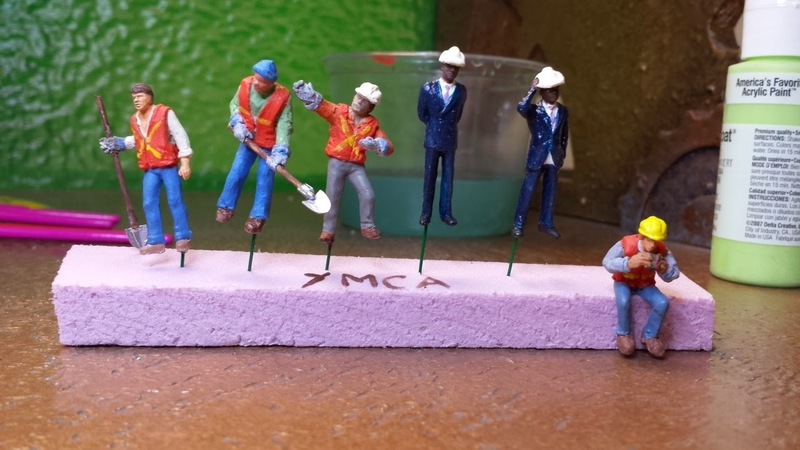 Due to time constraints on this job, we had to use 1:72 scale Prieser miniature people as the base forms, and repose them as necessary. A little heat on their appendages made posing them fairly straight forward. Although, Garfield did have to resort to Exacto knife surgery on a lot of their little arms and legs! 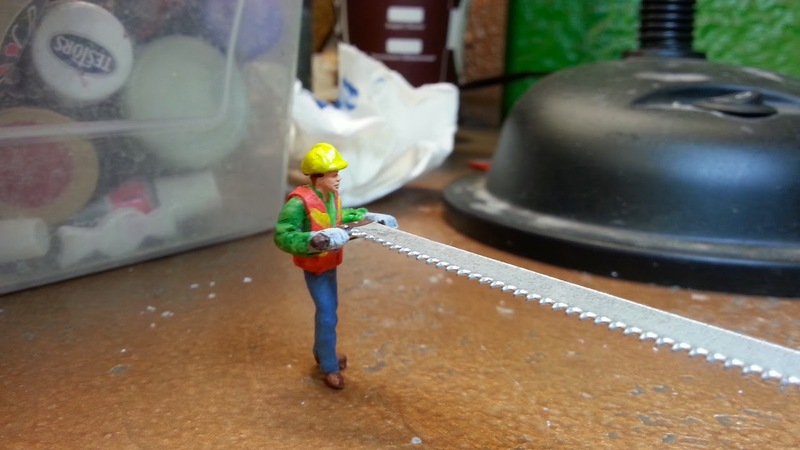 I love miniatures, and would really enjoy a constant staple of them! I never seem to get enough of it! 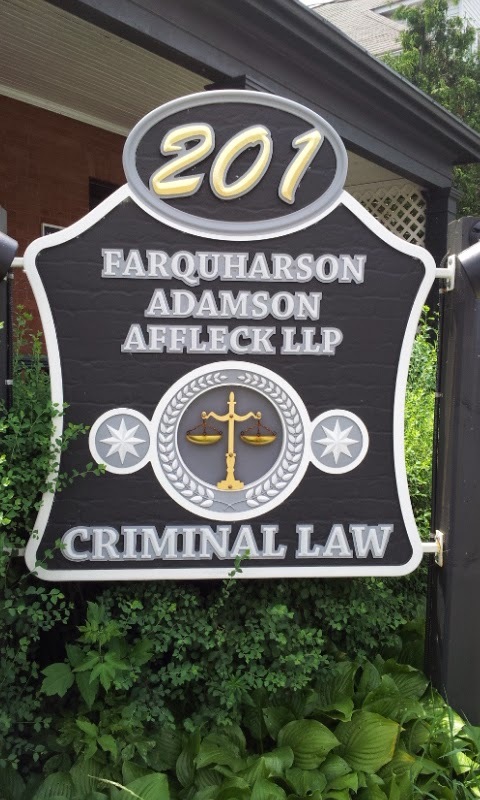 Because I had kept all the files on this job, I was able to create the new text portion of the sign in the exact spot where I needed it. This allowed me to punch through the texture of the original sign background, so the texture would be perfectly in sync with the old portion of the sign. Not being able to conceal the edge led me to putting a small raised border around the new inset piece. If you can't hide it, make it a feature! Our Techno cut out the whole section in around 45 minutes with a 1/4" ball nose cutter. This included the text and border cleanup toolpaths. The final piece fit in like it had been cut on a cnc router! 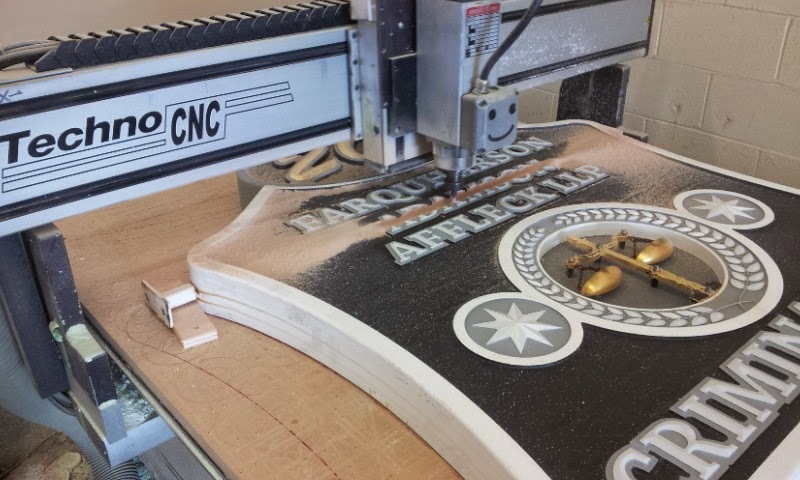 :) A Techno cnc router that is! The lighting at the time of install really hides the subtle brickwork texture, but as the day progresses, it really starts to pop. Although it's hard to see in the picture! The install went amazingly fast. It actually took longer to get it out of the van! It really is an eye catcher as you drive past it. It looks just as good at night under the lights on the posts as well! 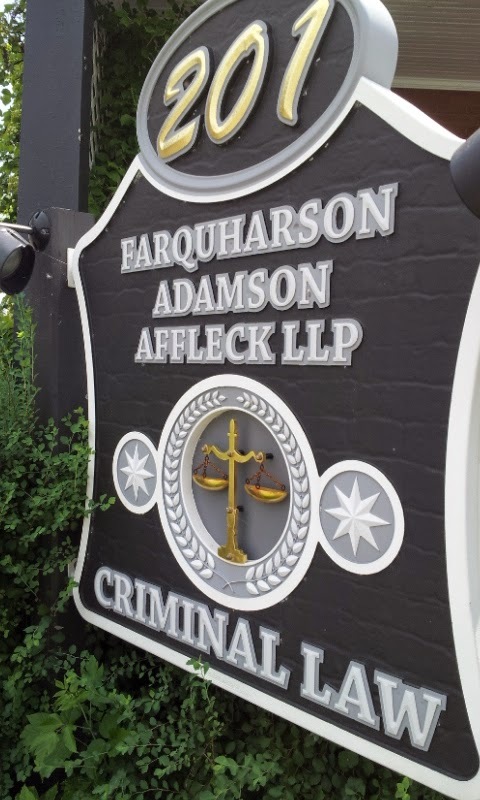 3 years ago, if you remember, we did a sign for a law firm in Oshawa. A city about 40 minutes from the shop. 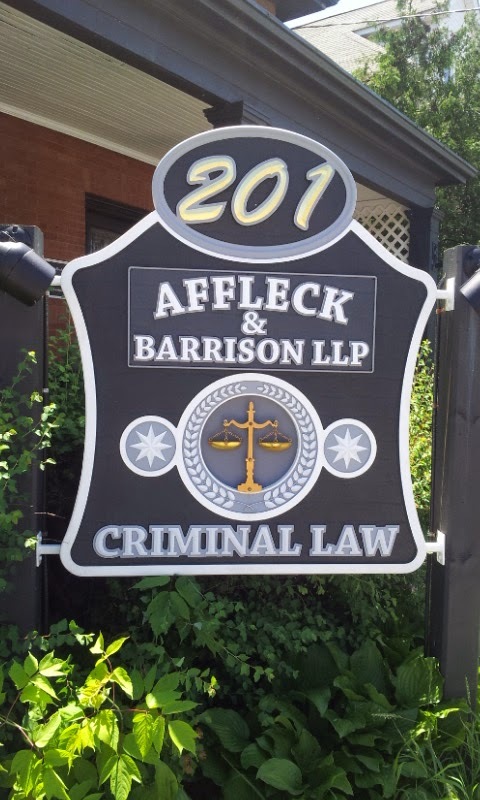 Well, I do believe that since that time, one of the lawyers has become a judge, and they needed the sign changed to reflect the new name! I knew at some point the name might change, but was kinda hoping it wouldn't! 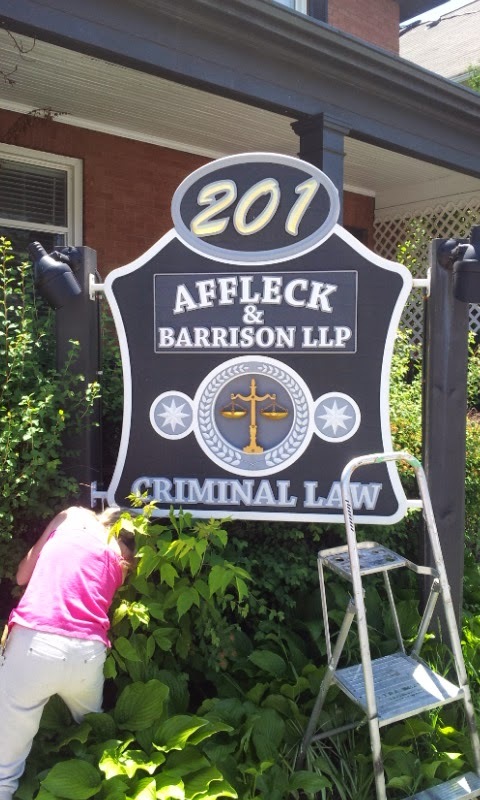 Our sign was in remarkable shape! The only issue I could see in terms of weathering, was the small chains on the justice scales. They had started to rust a little! I actually don't mind the real patina left by nature! Luckily, I keep almost every file I have ever created, so doing a name change on a sign like this isn't an impossible task. The biggest challenge would be crossing my fingers that it fit under the gantry on our Techno. 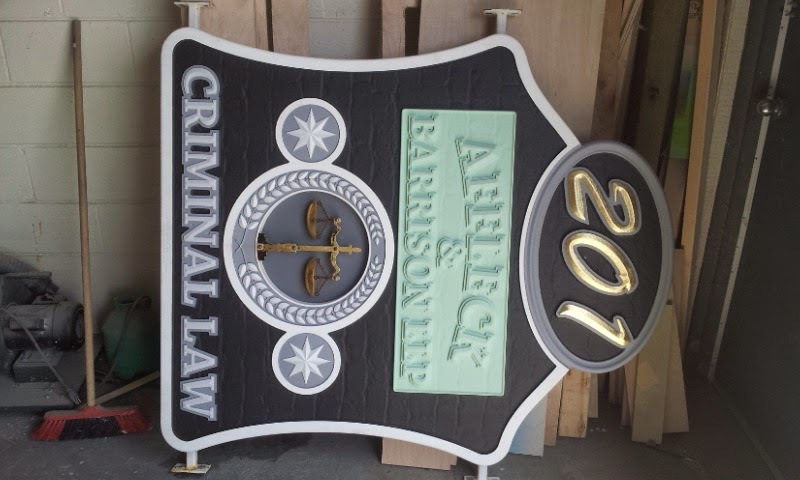 The original sign was cut in layers to allow for the welded steel frame inside. But now, the layers are all one piece! But the worry was for not! There were no mishaps, and everything worked out fine! Our first In-House Print! TAA-DAA! The other reasons for us to choose the KNP-3D printer was it's ease of use, dual extruders, and heated build plate. Maybe 10 years ago I would have loved the challenge of tweaking settings, adjusting variables, etc. But today, I just want something that sets up easily, and is pretty straight forward to use! I'll save the mental workload for the actual project, not the equipment that makes it! The printer came VERY well packaged, with an extremely easy to follow set-up guide. There was actually not much to do before using it! We had this printer running a file within 20 minutes of unpacking it. The slicing software that KNP recommends, and supplies on their downloads page, is the freely available Slic3r program. There is also a small, dedicated little converter program to convert the G-code from Slic3r to the X3G file format that the printer reads. I will be totally honest, I used Slic3r for about 2 hours after I ordered the printer last week, and immediately started an on-line search for a better piece of software. Not that Slic3r is bad, but I was very aware of it's limitations right from the start. So I purchased Simplify-3D. Now this is the way 3d printing software should be. Plus, Simplify 3D wrote a post processor specifically for the KNP printer, and had it back to me right away! I won't go into depth on the software, because it's pretty easy to find all the info you need on-line. But, for the additional $140, it would be silly not to buy it. If this was a hobby machine for us, and I just wanted a new toy, I probably wouldn't have purchased it, but as we will be using this for work projects, it was a no-brainer! One thing about FFF 3d printing is it's kinda slow! Not the machine, but just the whole concept of the way it works. Granted it's still faster to a degree over hand fabricating a full 3 dimensional character, but it's a little slower than you'd think! We wanted 2 different kinds of 3d printers for the shop. An FFF machine for larger parts, as well as a high resolution 3d printer for very small objects that need an incredible amount of detail. Having 2 different printers, as well as 2 cnc routers, and a laser cutter should cover all the bases of everything we could possibly have to make! 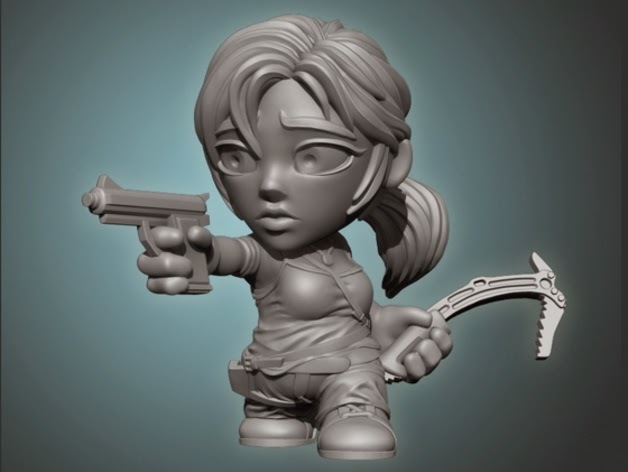 For our first print, I downloaded the Lara Croft 3d model from Thingiverse. http://www.thingiverse.com/thing:256452, as it was pretty much print ready. The color change was a result of using flash on the camera. The head I printed at 200 microns layer thickness, and the body I printed at 100 microns so I could compare the two prints. The Simplify 3d software prints a unique style of support structure based on a network of pillars. The software will also allow you to set the percentage of pillar offset. This determines how easily the supports can be removed. All of the above supports pretty much peeled right off the model in one piece, with very little effort! I also printed these from ABS styrene, because I might try the acetone post processing of the prints. Plus, everywhere I have read, ABS can be more difficult to print with, so I figured I should start with that! All said and done, I am VERY happy with the print quality. This printer does a great job, and is super easy to use. I think that combining 3d prints with laser cutting and cnc routered parts, will make our projects better, and easier, and that's how I like to roll! 3D Printing, our new addition to the family! Finally we have added 3d printing to our arsenal of tools. I am both a technology geek, as well as a tool lover. I have had my eye on 3d printing for a very long time! But the biggest drawback was quality vs. time. Time is of the utmost importance in our business. Most projects are a 3-5 day turnaround. But, quality can't suffer because someone needs it fast, so we have to find more effective ways to produce our custom pieces. That being said, 3d printing was well out of the budget of most small businesses. I remember pricing out a Dimension 3d printer, and it coming in well over $100, 000. That's great if that's all we were going to do, 24 hours a day, but that will never be the case for us. 3d printing will just compliment our current toolset, especially considering almost everything we do is designed in the computer anyway. 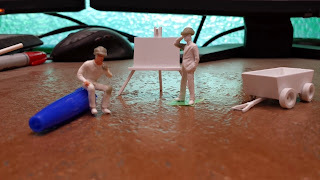 But with the current new onslaught of FFF 3d printers on the market, the prices have come down so far, that ignoring a 3d printer as a capable tool, is a grave mistake. 3d printing is here to stay! We spent a long time looking for a printer that would meet our needs. It had to be cost effective, run low cost materials, and the materials had to be available readily. It also couldn't be a clunky looking machine, with wires and motors hanging out all over the place. That doesn't instil confidence in anyone coming to the shop. Technical support, and warranty were the final deciding factors. These 2 factors are so overlooked, but should be first on most peoples list. This is why we went with the KNP3d 3d printer. This machine was put out by Klic-N-Kut USA. 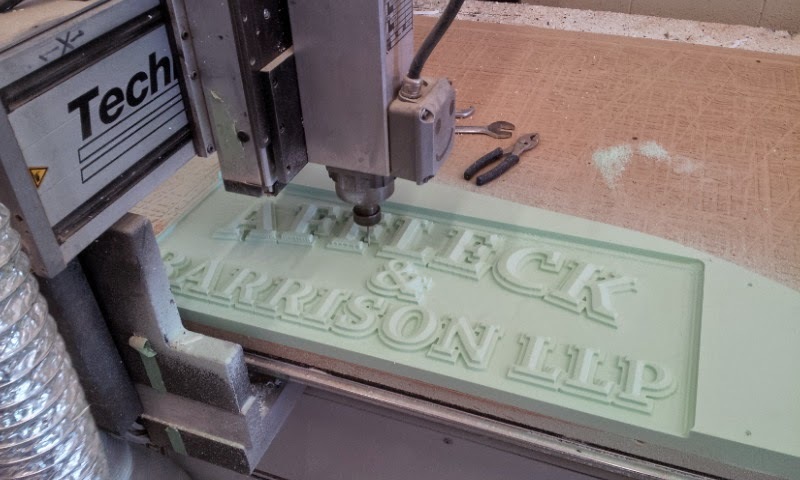 These guys have been making cutters and embossing machines for a very long time, so 3d printing would be a natural progression for them. 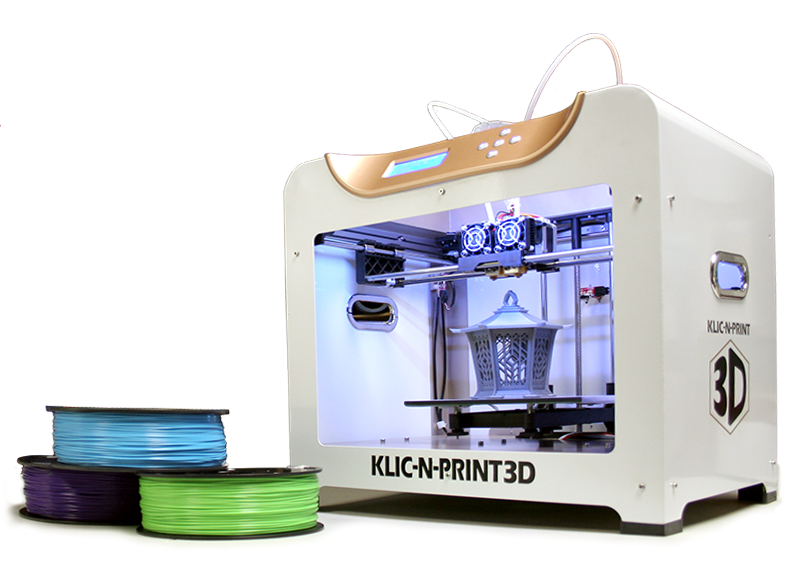 The knp3d retails for $1299, and comes with a full 1 year warranty. Most of these kinds of printers usually only have a 3 month warranty, so this is fairly huge! Stay tuned for our first print on this machine! It should be a fun new road for us!